PAINTER, sculptor and, most notably, horologist Louis Moinet was already 60 by the time novelist Jules Verne was born in 1828. But both lived in and around Paris from 1848 (incidentally the year in which Moinet published his Traite d’Horlogerie, considered the most comprehensive tome on watch-making) to 1853 (the year Moinet died). Both were regulars at the French Academy of Sciences, and so most likely had common acquaintances. Whether the two men did actually meet is still anybody’s guess, though. What is certain is that they shared a passion for astronomy, and they possessed imaginations far more wild than most people are blessed with. Take Verne’s Around the Moon, the follow-up piece to From the Earth to the Moon, as an example. Published in 1870, the novel narrates the journey of three men aboard a bullet-shaped projectile, orbiting the moon, and returning back to Earth by crashing into the sea — the three were eventually pulled out of the spacecraft by a US Navy vessel. Sounds familiar, right? 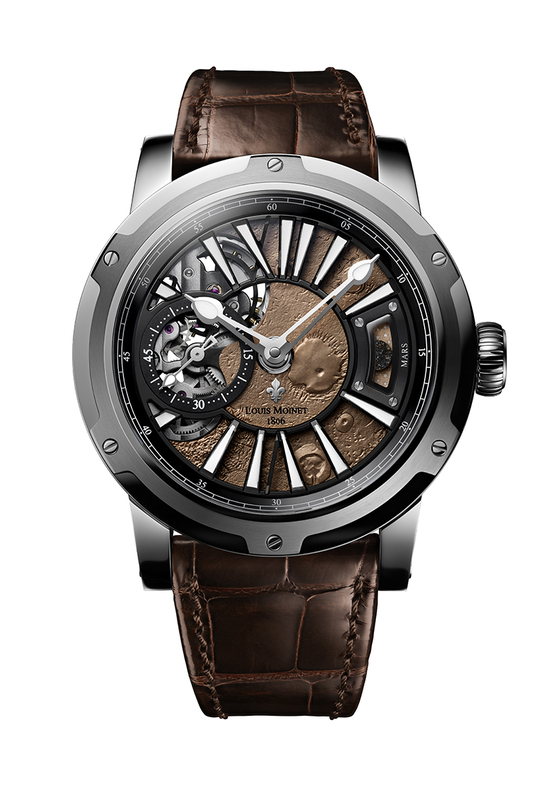 Now, Ateliers Louis Moinet, the maison that bears the eminent horologist’s name, is celebrating the upcoming 150th year anniversary of Verne’s seminal novel with the release of Moon, a limited-edition range composed of 60 pieces made of steel, and 12 in rose gold. Moon is a multi-layered piece of genuine haute horlogerie, featuring openwork flourishes on the hour markers, the dial, vertical bridges and even on the lugs. The hour markers in Roman numerals — a first for the Ateliers — have a satin, diamond-studded finish that’s meant to reflect the blue flange around them. 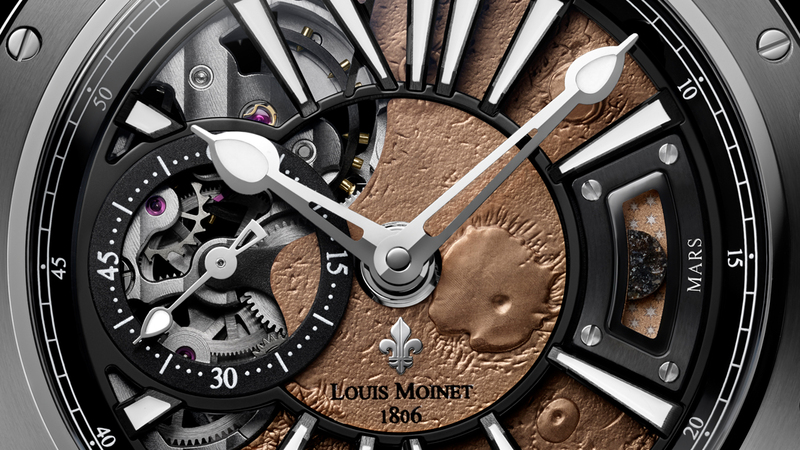 This touch, according to Louis Moinet, evokes the cosmos. Well, the numerals do appear to float in mid-air, giving them a spacey, weightless vibe. 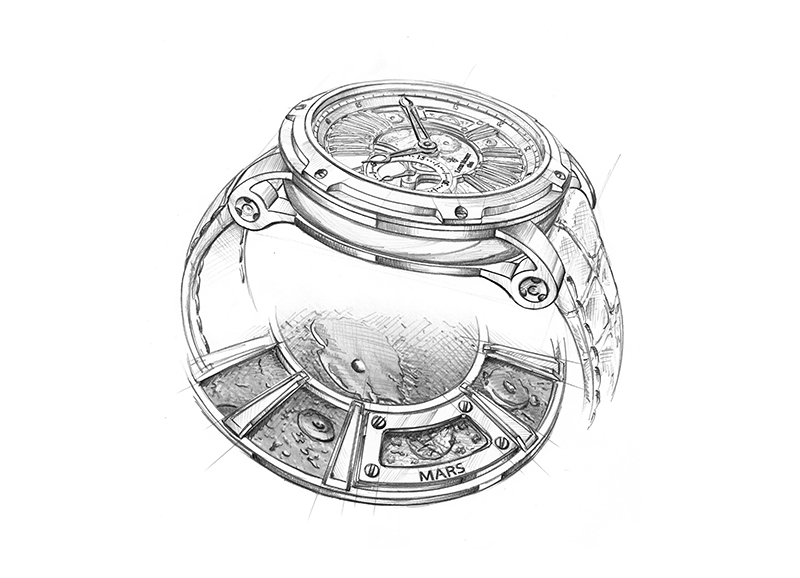 Beneath the watch’s openworked dial — a large aperture is located between 8 o’clock and 12 o’clock — is displayed the caliber’s escapement (the balance of which oscillates at 28,800vph). A skeletonized small second subdial at 9 o’clock “floats” above a portion of this aperture, but in no way does it obscure the view of the beating movement below it. All this is housed in Louis Moinet’s 43.2-millimeter Neo case that’s propped by two vertical bridges spanning the watch. Hollow lugs cap the foot of the bridges. 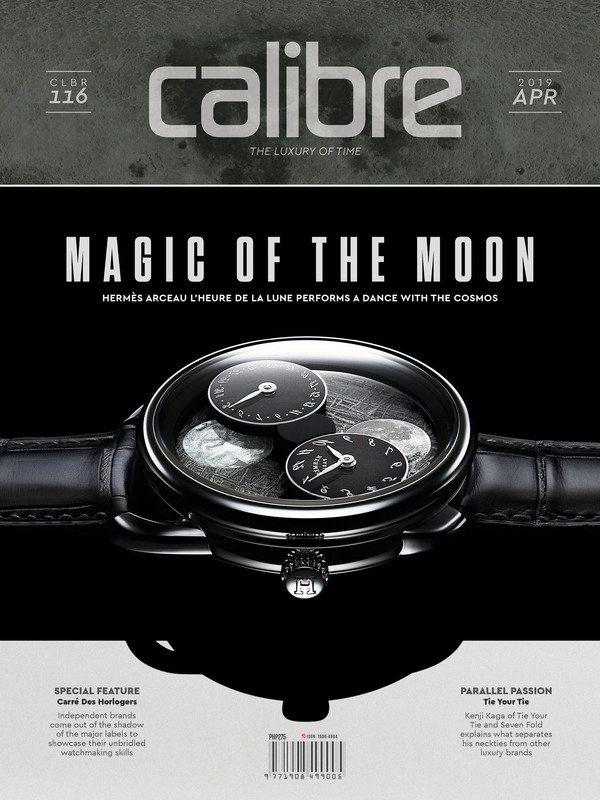 As a timepiece christened Moon (and which pays homage to Verne’s work) the watch has a dial that’s a faithful reproduction of a section of the lunar surface. Depicted on the brass dial are the most visible craters on the moon — Gassendi, Cassini and Tycho, with this last one described in detail in Around the Moon. And the watch’s moon theme isn’t merely evocative, too; mounted on the dial at 3 o’clock is a small capsule containing a genuine lunar meteorite fragment. Completing the tribute piece is an equally stunning and well-thought-out touch. The Moon is presented in a case made to look like the first edition of the Around the Moon book. Still, a second Moon presentation case has been considered. This one will be rendered in the shape of a lunar crater, in the middle of which will display another piece of lunar meteorite. Such touches should make one reach for the moon.